* While the last sentence in the quote seems to grammatically indicate (i.e. by antecedent) that Justin Martyr is saying that Christians also worship angels (to my knowledge, I am unsure whether we can affirm that he actually believed this), I would suggest taking it as a reference to the Father, the Son, and the Holy Spirit. 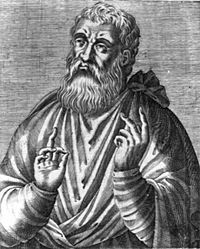 This entry was posted in Apologetics, Early Church and tagged Justin Martyr.